This week I’m back to one of my favorite books in English, Book of a Thousand Days, by Shannon Hale — Das Buch der Tausend Tage. Last time, I left off ready to start Day 35. = Hoffentlich kommt er sicher voran. “I’m in love!” = Ich bin verliebt! = Mein Herz ist so leicht, dass es in der Luft schwebt und mich trägt, sodass meine Füße nicht laufen müssen. = Ich singe den ganzen Tag und die Wäsche macht mir nichts aus. Daran erkenne ich, dass ich verliebt bin. Now I have to finish the paragraph! = Hin und weg von Mylord, dem Kater. May you be so happy this week that you can say, Mein Herz ist so leicht, dass es in der Luft schwebt und mich trägt, sodass meine Füße nicht laufen müssen. Meanwhile, ich singe den ganzen Tag. It’s time for Sonderling Sunday, that time of the week when I play with language by looking at the German translation of children’s books! Okay, it’s a little late for it tonight, but hey, it’s Daylight Savings Time, so my body doesn’t realize that I should be tired. I’ll try for a short one. And it’s time to go back to one of my favorite English books, Book of a Thousand Days, by Shannon Hale, >Das Buch der Tausend Tage, with the so gorgeous German cover. Last time (which I can’t believe was a year ago! ), I left off before Day 32, which starts on page 31 in the English edition, and Seite 42 in the German edition. “Rap, rap, rap” = Tack, tack, tack. And that’s all for tonight! I finished Day 32. But what useful things we’ve learned! After all, who would want to travel in Germany without knowing how to say “bodiless piglet”? 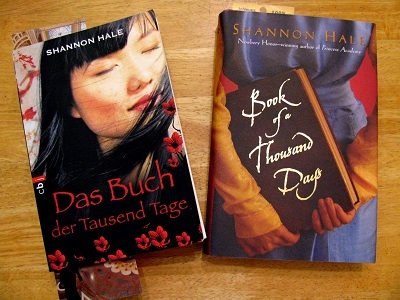 Tonight I’m going back to Book of a Thousand Days, by Shannon Hale, Das Buch der Tausend Tage. Last time I looked at this book, I was on Day 31, which is page 26 in the English version, and Seite 37 auf Deutsch. I think of Sonderling Sunday as a silly phrase book. Imagine coming across these in a phrase book. You know they’re useful phrases, since they’ve actually gotten used in a book! = Vor wenigen Minuten hörten wir eine Stimme. = Ich klemmte einen Holzlöffel in die Klappe, damit sie offen blieb. “Say you are me.” = Behaupte, du wärst ich. “I’m relieved.” = Das tröstet mich.
That’s it for that day! And for this day. Das tröstet mich to get back to Sonderling Sunday! This week, we’re finishing up judging for the Cybils. Don’t forget to check the announcements on Friday! But it’s fun to squeeze in another frivolous post, even as I’m madly reading! It’s Sonderling Sunday! That time of the week when I play with words by looking at the German translation of children’s books. Okay, Sunday is almost over, and I probably should forgo Sonderling Sunday until February is done and I’ve gotten moved. But I’m copying CDs anyway, and it really is fun. I’ll just do a little bit…. This week, I’m going to go back to Das Buch der Tausend Tage, The Book of a Thousand Days, by one of my favorite authors, Shannon Hale. Last time I looked at this book, we covered Day 6 and Day 11 of Dashti’s journal in the tower. Today we’ll tackle Day 13. I like this sentence. The word for “toe” of a shoe is different than the word for the part of your foot, Zeh. = Sie trägt modische Schuhe mit einem langen Schnabel, der sich zu ihrem Knöchel krümmt. = Ich fühle mich von den Haarspitzen bis ins Mark meiner Knochen wie eine Aratin. Ha! I saw this and thought they were talking about e-mail for a second! Hmm. In German, they say the lord’s house is as beautiful as baumen, trees, in Autumn, instead of “beautiful as a mountain in Autumn.” Again, I think it’s losing a little of Dashti’s voice. It’s time for Sonderling Sunday! – Otherwise known as Nerdy Sonntag. That’s when I play with language by finding German translations of useless and interesting phrases in children’s books. I’m going to do something a little different tonight. I got the idea of Sonderling Sunday thanks to the brilliant and kind James Kennedy sending me a copy of his book Der Orden der Seltsamen Sonderlinge, the translation of The Order of Odd-Fish. It even has Sonderlinge in the title! But, let’s face it, it’s taking a long time to go through the book! That’s because my German is definitely not fluent, and it takes me time to wade through the text, find interesting phrases to use, and such. Now, I have quite a collection of German books, and recently the fabulous Shannon Hale sent me a copy of one of my all-time favorite books, Book of a Thousand Days, translated into German, Das Buch der Tausend Tage. Tonight, in appreciation to Shannon Hale for her kind gift, and because I’ve been itching to get to it, I will begin with Das Buch der Tausend Tage. 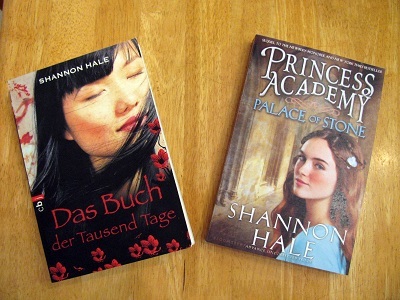 I took this picture when she sent me Das Buch der Tausend Tage along with an Advance Reader Copy of Palace of Stone. Let’s start with stats. As always, the German version is longer. In English, we’ve got 308 pages, contrasted with 319 in German. So it’s not a big difference, but the German print is somewhat smaller. As with Der Orden der Seltsamen Sonderlinge, I will try not to give any spoilers, but do hope that I’ll pick some intriguing sentences and phrases that will motivate some readers to pick up the book. My lady and I are being shut up in a tower for seven years. Lady Saren is sitting on the floor, staring at the wall, and hasn’t moved even to scratch for an hour or more. Poor thing. It’s a shame I don’t have fresh yak dung or anything strong-smelling to scare the misery out of her. Meine Herrin und ich werden für sieben Jahre in einen Turm gesperrt. Lady Saren sitzt auf dem Boden, starrt die Mauer an und hat sich seit einer Stunde nicht mal gekratzt. Die Ärmste, Schade, dass ich keinen frischen Yak-Fladen oder etwas anderes streng Riechendes habe. Ich möchte sie erschrecken, damit sie ihr Elend vergisst. Die Männer mauern die Tür zu. Ich höre, wie sie murmeln und kratzend den Zement verteilen. Oben klafft nur noch ein kleines, nicht zugemauertes Viereck aus Himmel und Licht. Ich lächele gegen sein gemeines Grinsen an, um zu zeigen, dass ich mich nicht fürchte. Das ist doch schon mal was, dass sie sich unseretwegen so viel Mühe geben. Ich fühle mich wie ein Edelstein in einer Schmuckschatulle, obwohl ja meine Herrin der. . .
“Like an angry piglet.” = Wie ein wütendes Ferkel. “snoring on my lap” = schnarchend auf meinen Scho? So, that’s a good start! I’m looking forward to attempting to use such handy-dandy phrases as frischen Yak-fladen, das Trostlied, ein Edelstein in einer Schmuckschatulle, wie ein wütendes Ferkel and especially schnarchend auf meinen Scho?. Tune in next week, as we’ll find out more about what the Belgische Scherzkeks is up to!